Letter to Jane is, in one sense, a very long lecture (or harangue) by two filmmakers that is almost the purest example of agitprop in cinematic history as well as possibly the most graceless. But it still makes fascinating viewing and sums up a period in the political life of cinema that can be linked to the more formalist stylistic strictures of Lars Von Trier’s Dogma Group. This extraordinary little movie emerges from the then recently formed French Dziga Vertov film collective, led by Jean-Luc Godard and Jean-Pierre Gorin. The collective produced a number of provocative films that show a distinct move away from the more ‘middle class’ narratives of a film like Pierrot le fou (Godard, 1965). 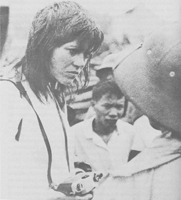 In Letter to Jane, a single news photograph (see further discussion below) first appears on the screen: it is of Jane Fonda towering above some Vietnamese, and on the sound track Jean-Luc Godard and Jean-Pierre Gorin discuss the implications of the photograph. Their talk is didactic, and reveals what Laura Mulvey referred to later as Godard’s “always interesting” misogyny (quoted in Williams 1992: 84). Certainly the intensity of a film consisting of a still picture and two ideologues berating the subject of the picture has something of the feeling of a show trial about it. The Marxist/Maoist Dziga Vertov movement and Jane Fonda’s own short career as a bourgeois idealist collide in what in retrospect is a film by two rather privileged intellectuals who both seem to lack a sense of history’s ironies. Godard and Gorin had originally become united in a dream of a new revolutionary cinema and to all intents and purposes the Dziga Vertov Group became these two men as other members broke off to form their own equally obsessive and more or less purist groups. Pravda (1969) was post-produced by Gorin while Godard completed cutting Vent d’est in 1970. Based on the writings of Mao Tse-tung and Brecht, Pravda is itself a fairly minimalist piece with two voices, those of Godard and an anonymous woman (more misogyny?) on the soundtrack of this 58-minute monotonal polemic. Vent d’est is an equally feisty collage of polemics, politics, and agitprop theatrics. The earlier film Tout va bien (1972) was intended to star Jane Fonda, with the attendant ease of financing but her final reluctance to appear in the production (she had big problems with the script – not least its noisy politics) may well have triggered the more biting polemic of Letter to Jane. In fact Fonda, after a notorious harangue lasting three hours from Gorin, had finally agreed to appear in the film. But her role was a small one, appearing as the host of a radio show for the imaginary American Broadcasting System. Whatever the real reasons for her falling from grace with Gorin and Godard, they seem, 30 years on, to have been repaid in full measure. Thus, the entire premise of Letter to Jane is a deconstruction of a notorious news photograph of Jane (Hanoi Jane was her nickname in America at the time) visiting Hanoi and surrounded by Vietnamese communists. The best parts of the film function as a withering critique of the iconography of Hollywood and the (fashionably unfashionable) Hollywood star system. Ironically, this system or its European model, was something Godard had in a lesser way made use of, or at least flirted with, in such films as Le Mépris (1963) with Jack Palance and Brigitte Bardot. This section of the film makes use of stills from The Magnificent Ambersons (Orson Welles, 1942) and other movies including Klute (Alan J. Pakula, 1971 and starring Jane Fonda) and The Grapes of Wrath (John Ford, 1940 and starring Jane’s father Henry Fonda), as well as publicity stills from Tout va bien. But the main part of the film repeatedly scans the photo of Fonda (taken by photographer Joseph Kraft and subsequently published in “L’Express”). This image is repeatedly analysed, in its original form, or cropped, to enable examination and deconstruction of various elements of the images – such as the traditionally garbed Vietnamese. In spite of the sometimes elegant, sometimes plain bloody-minded commentaries and voiceover debates from Gorin and Godard, the film remains the purest example of minimalist political filmmaking at its most simplistic and as such resembles as much a piece of radical underground anti-film practice as anything in the history of cinema. But the film also indicated a dead end in polemic film practice, remaining cold and alienating for all its exhilaratingly coruscating dialogue and visual intensity.